There was some “lack of structure, a lot of discipline issues and a lot of fights,” says Kammerman, a veteran administrator in Texas’s Fort Bend Independent School District. Fights were so common, at least one or two a day, that it wasn’t until May that the school had a fight-free day. The first fight-free week didn’t occur until mid-May. Fistfights, cursing, defiance, and other acts of disruptive behavior and rule breaking typically resulted in an in-school or out-of-school suspension. In some cases, students were expelled, despite the fact that one of the biggest barriers to academic success is time out of class, Kammerman says. Kammerman was determined to find a different path. At a conference that spring, she read about a session spotlighting an alternative approach to discipline that shifts the focus from punishment to wrongdoing prevention. She had her entire administrative team attend the session on restorative justice. Some attended twice. With its roots in the juvenile court system, restorative justice (also referred to as restorative practices, restorative discipline, and restorative measures) is not a new concept. School districts in California, Colorado, and Minnesota have long been reporting success with its focus on repairing harm, rebuilding relationships, and collectively holding those who do harm accountable for their actions. School districts increasingly are embracing the practice as a way to address the disproportionately high rates of suspension and expulsion for minority students. They are rejecting the punitive, zero-tolerance policies that many civil rights and children’s advocates say created the so-called “school-to-prison pipeline” by pushing students out of school and into the juvenile and criminal justice system. In Texas, a San Antonio school had grabbed headlines because of a dramatic decline in discipline problems after adopting the approach in 2012. Ed White Middle School reduced out-of-school suspensions by 87 percent and in-school suspensions by 29 percent in the first year of implementing restorative practices, says Marilyn Armour, who worked with the school as director of the University of Texas at Austin’s Institute for Restorative Justice and Restorative Dialogue. In-school suspensions fell by another 52 percent for the pilot group in the second year; tardies declined by 39 percent. The once-academically challenged school achieved stars of distinction for student performance in English, math, and social studies. When it comes to discipline, restorative justice presents “an amazing opportunity to really move things in a different direction,” says Armour, a professor of social work. Her institute now partners with the Texas Education Agency to expand restorative discipline training statewide. Fort Bend ISD is one of the districts that has signed on. 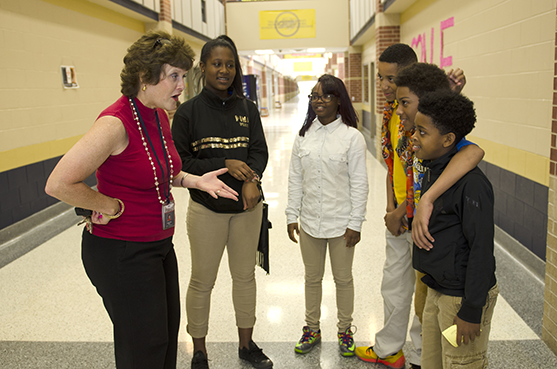 Formal tools and strategies were implemented during the 2015-16 school year at 13 of the district’s 14 middle schools, including Missouri City Middle, starting with the sixth grade. In 2016-17, restorative discipline will be implemented at all 14 middle schools in the district. “Schools have talked for years about the importance of building strong relationships with students, but when it comes to discipline, it’s as if we all of a sudden cross into this old-school style of command and control and severe consequences,” says Fort Bend Superintendent Charles Dupre. Kammerman recalls a student whose refusal to comply with a teacher’s request to stop talking escalated into an uncharacteristic outburst of cursing and anger. “In the past, he would have been given an in-school suspension for using profanity,” she says. Instead, after an assistant principal engaged the student in a restorative conference and contacted his mother, he discovered the family was experiencing severe financial difficulties. There was no food in the house. No electricity. After getting the student a meal, comforting him, and letting him know that teachers and staff at school were there to help, the conversation turned to what he needed to do to make things right with the teacher who had been disrespected. Restorative justice brings together parties voluntarily following a crime or wrongdoing to address the harm committed, make amends, and restore, to the extent possible, the trust that was broken in the relationship, Amour explains. The wrongdoer, after making amends and taking responsibility, can and should have a place as an active, contributing member of the community, thereby reducing the likelihood that he or she will reoffend, says Keith Hickman, director of continuing education for the International Institute for Restorative Practices (IIRP) Graduate School in Bethlehem, Pennsylvania. That’s a completely different mindset when compared to the traditional punitive approach to justice, where “the behavior and the individual are bundled together and cast out,” he says. A variety of practices and strategies are used to facilitate restorative justice, including small group discussions called circles, peer mediation, restorative conferences, and re-entry conferences, among others. Some practices are reactive and designed to help repair or respond to a harm. Others are proactive and focus on building community and relationships. Using talking circles and check-in circles, for example, are important for establishing a trusting relationship that can be tapped into when wrongdoing occurs, Hickman says. They help students feel obliged to the community and invested in repairing harm. Education and social science researchers, child welfare and civil rights organizations, and lawmakers have urged a move away from highly punitive, zero-tolerance school discipline policies. Developed in response to initiatives such as the Gun-Free Schools Act of 1994, and the Columbine school shootings in 1999, the policies were intended to make schools safer. What did happen was an overuse of suspension and expulsion, often for minor infractions -- stealing a bottle of water from the cafeteria, for example -- and applying those punishments disproportionately to certain groups of students. According to federal data released in June, black students grades K-12 are nearly four times as likely to be suspended as white students. Black students also are nearly twice as likely to be expelled -- removed from school with no services -- as are white students. And the disparity also exists for the youngest children. Black preschoolers are 3.6 times as likely to receive one or more out of school suspensions as white preschoolers. Students with disabilities in grades K-12 are more than twice as likely to receive out-of-school suspensions as their non-disabled peers. And American Indian or Alaska Native, Latino, Native Hawaiian or other Pacific Islander, and multiracial boys are likewise disproportionally suspended. They represent 15 percent of K-12 students but 19 percent of K-12 students receiving one or more out-of-school suspensions, according to the federal Civil Rights Data Collection. The number of students given suspensions declined by nearly 20 percent between 2011-12 and 2013-14, but the costs remain high, both to students and taxpayers. A recent analysis by UCLA’s Civil Rights Project estimates that suspensions in 10th grade alone probably result in more than 67,000 additional high school dropouts nationally. Over the course of a lifetime, each additional dropout is responsible for $163,000 in lost tax revenue and $364,000 in other social costs, such as health care and criminal justice expenses, according to the study. Cumulatively, the cost for those 67,000 dropouts exceeds $35 billion, a likely conservative estimate, say researchers. The U.S. departments of Education and Justice issued joint guidelines in 2014 recommending that schools revise punitive discipline policies. In their place, the agencies highlighted alternatives such as restorative practices, noting that they have the added benefit of fostering a positive school climate. The failure of zero tolerance and the issue of disproportionality have “been the impetus for all of these kinds of restorative programs,” says Vickie Shoap, a restorative justice specialist with Virginia’s Fairfax County Public Schools. Shoap joined the district in 2011, the same year that a student committed suicide after he’d been recommended for expulsion for a minor drug infraction. Armour points to Dayton, Ohio; Chicago; and Syracuse as examples of school districts that have not only instituted restorative practices but have also revamped their Code of Conduct to include restorative measures. New York City and Minnesota’s St. Paul Public Schools have recently committed key funding to expanded restorative justice initiatives. The U.S. Department of Justice is funding a $3 million, two-year study conducted by the RAND Corporation of 22 Pittsburgh schools implementing restorative practices. The National Institutes of Health committed $3.2 million for another RAND study of 14 middle schools in Maine using restorative practices. The Maine study is analyzing data on school climate and connectedness, student achievement, empathy, bullying behavior, and peer attachment. The Pittsburgh study is examining the challenges and successes related to implementation along with student behavior and other measures of school safety. San Francisco Unified School District has been implementing restorative discipline practices since 2009, when restorative work became the first piece of the district’s intentional effort to address disproportional discipline and high suspensions, says Thomas Graven, executive director of the district’s Office of Pupil Services. Recent data show that the effort has paid dividends: Between 2011 and 2015, overall suspensions were down by 57 percent. African-American suspensions were down by 61 percent, Latino suspensions down by 56 percent. While some of that decline “can definitely be attributed to our work around restorative practices,” Graven notes that the district now uses it in conjunction with other measures, especially Positive Behavioral Interventions and Supports, a system developed by the Education Department. With more than 100 schools in the district, “we are striving for every school to use restorative practices, but the use does vary from site to site, says Ben Kauffman, a supervisor with the Office of Pupil Services. Restorative practice coaches actively work with schools to assess their needs and determine how to most effectively partner with them, he says. The issue of training and mentoring is of major concern to Shoap and others. Without adequate training, mentoring, follow-up and support, any restorative justice effort is likely to stall, says Shoap, a former restorative facilitator in Virginia's criminal justice system. Fairfax has developed its own certification program in which facilitators are trained and then mentored in their schools “just like student teachers, until we feel that they’re ready to go forward on their own and they’re comfortable,” she says. The district has recently trained nearby Maryland’s Montgomery County Public Schools and Virginia’s Loudoun County Public Schools in its certification process. A common concern lobbed at the restorative justice approach to school discipline is that it’s “too soft” on wrongdoers. Advocates and practitioners like Shoap are quick to disagree. “It’s a very hard to sit down and talk about what you’ve done and who you’ve harmed and how you can change that behavior and make things right,” she says. Conversely, giving someone a three- or five-day suspension at home, where they can sleep late, watch TV, text, and even keep up some school-based drama or hostility, is easy and does not evoke behavior change, she says. Michelle Healy (mhealy@nsba.org) is a staff writer with American School Board Journal. Restorative practices were put into play in Florida’s Lee County Schools after a music video made by nine members of a high school basketball team and containing profane and sexually explicit lyrics made its way to social media in January. The district already had been piloting the use of restorative justice in several schools in anticipation of expanding its use districtwide this school year, says April Thompson, a prevention specialist in the district’s office of Student Services. Initially, the players were suspended for five days during a district tournament and banned from all athletic activity for the remainder of the school year—a response that “did not take into consideration any restorative process,” says Thompson. Later, however, students, their parents, community advocates, and school leaders and officials came together and “had an open conversation about what happened, who was harmed, and what could be done to restore the situation,” she says. As a result, the out-of-school suspensions were reduced, the students were eligible to play during the tournament, and community service was required of the students. That service included working on an educational video with the district’s communications office that addressed the responsibilities of digital citizenship. The students “got to research and learn what it means to be a digital citizen, the importance of protecting your identity and what you share online, but also spread that message to other students in the district,” Thompson says. Having to come face-to-face with the person, or in this case, the community you harmed, along with witnesses, school personnel, and parents weighing in, and having to address your actions, hear directly how it has affected others and be held accountable is much more difficult than simply being sent home for three days, says Thompson, a former juvenile probation officer.